One of the earliest obtainable specific maps of Charleston, South Carolina. Esquisse des Opérations du Siège de Charleston, Capitale de la Caroline Méridionale, en 1780. An excellent highly detailed 1787 American Revolutionary War map of Charleston, South Carolina. 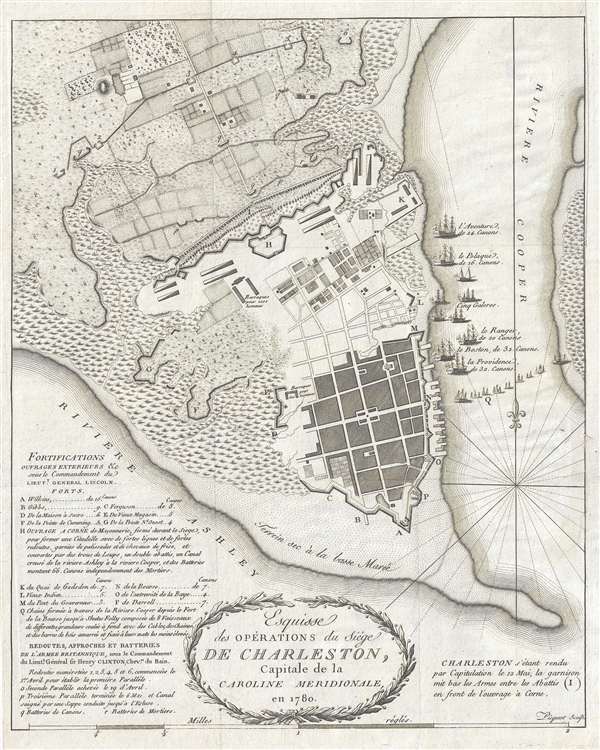 Illustrating the 1780 Siege of Charleston, a major American Revolutionary War battle, the map covers the peninsular tip of Charleston and predates many of the landfills and expansions that followed as the city developed. The port is evident as is the early grid structure. The Circular Congregational Church, which still stands and was built in 1695, is recognizable. Swampland is mapped to the west of the city and farmland appears just north of the city fortifications. The Siege of Charleston took place from April 1st to May 12th, 1780, late in the war when British forces, suffering setbacks in the northeastern colonies, instead decided focus on winning the south. Over some six weeks, the British under the command of General Sir Henry Clinton, outmaneuvered the Continental defenders led by General Benjamin Lincoln. The resulting Continental defeat and surrender was the Revolutionary War's greatest single troop loss. Detailed letter keys identify both American and British fortifications. The blockading British fleet, comprising 9 ships each of which is named, appears in the Cooper River. This map was issued to accompany the 1787 first French edition of David Ramsay's (1747-1815) History of the Revolution of South-Carolina or, more properly, Histoire de la Revolution d'Amerique par rapport a la Caroline Meridionale. The French edition of Ramsay's history was issued 2 years after the English edition. The map, which was originally engraved by the Charleston engraver Thomas Abernethie, has here been re-engraved in French by Charles Picquet. While cartographically similar, Piquet's engraving is more sophisticated and refined. This is one of the earliest obtainable maps of Charleston and is rare on the market. Very good. Upper right margin extended. OCLC 494256020. Nebenzahl (Biblio) #84.